Today the organization has grown to supporting an after school drop in space, weekend concerts and special events, and hosting over 20 after school programs in visual and media arts, music performance and technology, literary arts, community leadership and education. During the school year approximately 350 young people visit weekly, 200 young people visit summer programming, and another 500 young people visit through school and community partnership projects during the school day. Neutral Zone has demonstrated key benchmarks for sustainability. The Board of Directors is reflective of our mission, nearly half our board are teens leading through partnership of youth and adults to govern our center. 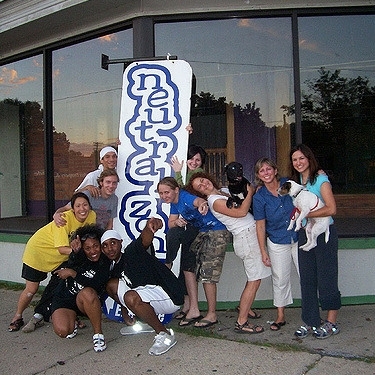 In 2006, Neutral Zone hosted a capital campaign and generated $4.2 million in community pledges to purchase and renovate its own building; supporting the NZ to now own its home. Additionally in 2016, Neutral Zone leveraged the Endless Zone Campaign to successfully raise a three month operating reserve to support the organization in times of financial shortfalls and support innovative opportunities for growth. Over the past decade, Neutral Zone has been recognized locally, regionally, and nationally as a high quality youth development program, one that is both effective in delivering programs using research proven best practices and one that is distinct. In October 2009, Neutral Zone was awarded the MetLife Foundation Innovator Award, one of six given throughout the country, for high quality programs that serve older youth. And in June 2017, Neutral Zone was awarded the Richard Huegli Award for Program Excellence from the Community Foundation of SE Michigan. Neutral Zone has also been featured in The Nation as one of the best leadership programs in the country (Nov. 2007). Youth Today (July 2014), After school Matters (Spring 2016), and After school Matters (Spring 2016) featuring the Neutral Zone’s unique youth-driven approach. In 2018, Neutral Zone was published in the Journal of Ethical Leadership for its effort on student voice (April 2018).In the past seven years, Neutral Zone has provided intensive training and coaching in our Youth Driven Spaces approach for more than 80 organizations and schools. Neutral Zone has taught courses on Youth Driven Practice at the University of Michigan School of Social Work and is currently engaged in a two year partnership with Eastern Michigan University School of Education to offer a fellows program for future educators to use the youth driven space approach in their classroom practice. To learn more about our current organization click here.